Foolish things I’ve done to be green…. It’s April Fools Day and here’s a look back at some of the really foolish, yet very earnest, things I’ve tried in the name of planet protection. This list is by no means complete, and I’m sure I’ll have some new items for 2013! Environmental mascot – this is foolish, yet fun! During all of my years of dancing, I was always a good technician, yet a lackluster performer. This situation was due to the fact that I found being in front of an audience to be a little embarrassing. A good mascot costume solves that problem – all of the fun of performing, with absolutely none of the recognition! When I was asked to be the EPA “water drop” during 25th anniversary Earth Day celebrations on the Washington DC mall, I couldn’t turn them down. Then came the pinnacle of my mascot career – Woodsy Owl! So foolish, yet so much fun! As Woodsy, I spread the environmental message AND joined in an aerobics demonstration, entertained little kids and the Secretary of Transportation, and danced with abandon in my yellow birdy feet at yet another Earth Day celebration. To prove my mascot-prowess, I have an official photo of myself (Woodsy). Visiting the Dismal Swamp after a major flood in August – I’m often referred to as the Julie McCoy of our family, planning all sorts of activities and trips. One type of trip I love planning is the outdoorsy, environmentally-educational trip. But there was one time when I ran the family’s Love Boat aground. I had read that the Dismal Swamp in southern Virginia was an absolutely beautiful place – I’ve seen pictures since our fateful trip, and indeed, it is a memorable spot. But timing is everything in life. I ignored our friends who mentioned that maybe “dismal” wasn’t a good name for a family vacation spot, maybe right after a major flood wasn’t the right timing, and maybe the mosquito population would be booming in the middle of August. “Pshaw!” I said. This was a natural area just waiting to be discovered by me and my family! We loaded up my then 2 year old son in the hiking backpack and headed into the swamp! Approximately 30 minutes later, we emerged with our tails between our legs, sweaty and swollen from mosquito bites. Fortunately, we didn’t catch malaria, I didn’t turn our Love Boat excursion into Gilligan’s 3-hour tour, and there was a nearby reggae festival to help us forget our swamp sorrows. Super-easy, super-delicious. This recipe works well for a hot dish at dinner or a cold dish for lunch leftovers. It's adapted from one I saw on the Today Show. 1) Cook pasta until it's al dente. 2) Mix together olive oil, parmesan cheese, lemon juice, salt, pepper, and basil. 3) Pour liquid over pasta and toss with pine nuts or almonds. You put your whole self in! I went to a terrific event at my son’s school last Friday night that reminded me of this line from the “Hokey Pokey.” The event was called “Make the Cut,” and it was an event for people to donate hair to make wigs for cancer patients. Over 50 boys and girls at Thoreau Middle School donated 8 inches of hair in honor of one of their classmates who is currently battling cancer. What a great group of kids, willing not just to raise money, but to literally give a piece of themselves to help others! Watching these inspirational students got me thinking about volunteering in general, and volunteering for the environment in particular. Although contributing money or participating in a walk-a-thon are great ways of supporting your favorite charity, giving of your time and talents is often even more challenging and more rewarding. One of the ways we can actually “put our whole selves in” to volunteering for the environment is through citizen science. Never heard of it? Well, it’s a way for members of the public to participate in environmental scientific research. I know folks who have participated in scuba diving to help with oyster research in the Chesapeake Bay, folks who have counted nesting loggerhead turtles in the middle of the night, folks who have climbed into chilly creeks to help with amphibian research in the Shenandoah mountains, and folks who watch pandas at the National Zoo for hours on end, logging each of the panda’s movements for researchers to later analyze. When I was working on my dissertation on butterfly gardens, I used nearly 100 “citizen scientists” to help me with my research. My volunteers counted butterflies each week from May to October during the hottest part of the day and submitted their results so that we could learn more about the usefulness of these habitat islands. Citizen scientists participate in bio-blitz activities in the Potomac Gorge and other spots nationwide. They help count winter birds through Project Feeder Watch and tag monarch butterflies with Monarch Watch. They help survey fireflies in their yards during the summer, and survey for eagles in the winter in New Jersey. The Sierra Club even offers opportunities for service trips for citizen scientists and volunteers! Want to know more? Listen to the most recent program on the Animal House about citizen science. Citizen science is a great way to get a little bit more involved in environmental science and volunteering. It usually requires no special training (they’ll train you), but if you have a specific expertise that’s nothing but an extra plus! And just like the kids who “put their whole selves in,” the rewards of this type of volunteering are exciting and memorable! Anyone who’s ever been to an Italian festival knows about sausage, pepper, and onion. Here’s the vegetarian version; we call it “Italian soul food” at our house! During our honeymoon, my husband and I went snorkeling in Hawaii. What a great surprise it was for us when a large sea turtle came swimming by – so graceful in the water. Ever since then, I’ve loved seeing sea turtles. For me, one of the highlights of our annual vacation at Edisto Island in SC is seeing the loggerhead turtles (Caretta caretta). The state park beach that we visit is shared by humans and loggerheads, as well as many other species. During the summer, female loggerheads come up on the beach at night to lay eggs. 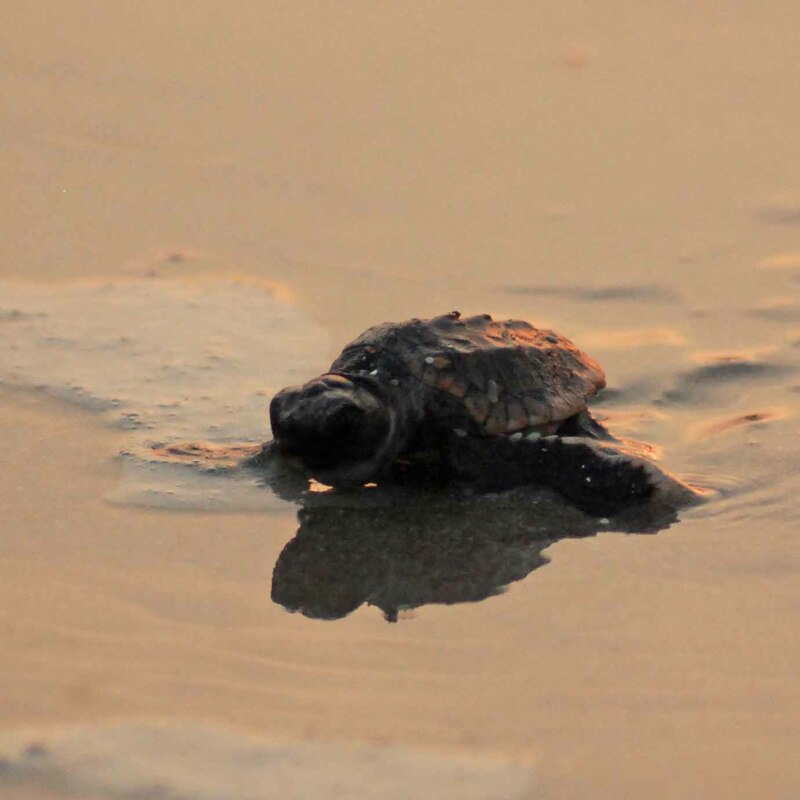 Within roughly 60 days, the eggs hatch and the hatchling turtles make their way to the sea. Because the loggerhead was listed in 1978 under the U.S. Endangered Species Act, state park personnel help to release any additional hatchlings that don’t make it out of the nest. That’s the day that is the highlight of my week! Visitors to the park are allowed to follow the park personnel to the nests and watch (no touching allowed) as they dig out any eggs that didn’t hatch, any dead hatchlings, and any living hatchlings. The state park personnel carefully log all information about the nests. Then the park visitors can watch the hatchlings make their way to the sea! The park staff instruct us to stand in two parallel lines from the nest to the ocean. They release the little hatchlings, and we watch them scuttle towards freedom. I’ve seen baby turtles countless times, making their way to the ocean, in nature films. Cute as that is, nothing compares to watching them in person. Those flippers that make it look like they’re flying through the water aren’t quite as graceful on land. The hatchlings struggle to make their way across the sand, getting knocked on their backs by the waves, flipping back on their stomachs, and starting again toward the ocean. We humans have to stand still to avoid accidentally touching or stepping on the hatchlings. What an incredible sight to witness as the sun sets on Edisto beach! Loggerheads begin their lives on beaches, travel out to the deep ocean to begin maturing, spend several years in near-coastal waters, and return to the beaches to lay eggs. Their migration can cover over 7,500 miles! The average loggerhead grows from a 2 inch hatchling to a 250-pound adult! Loggerheads eat bottom-dwelling invertebrates like crabs and crustaceans. They also eat jellyfish at certain stages of development. The biggest threats to loggerheads include capture in various types of fishing gear, as well as direct harvest and beach habitat loss. The U.S. has worked with shrimp fishers to require turtle excluder devices (TEDs) on shrimp nets, and, since 1989, has prohibited import of shrimp harvested in a way that could adversely affect turtle populations. More info from NOAA. If you’re interested in learning more about loggerheads, check out this beautiful documentary: Turtle, the incredible journey. Here's today's recipe from Christa Kermode, the March Treehouse Chats Interview. Simple, yet tasty! Combine all ingredients and bake for 30-40 min at 350. New Frog Species in the Big Apple! An update to my leap-day post on frogs -- a new frog species has been identified in New York City! 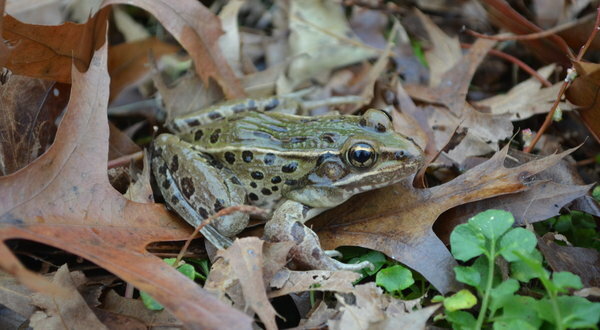 It's a species of leopard frog, and has a relatively limited range in New Jersey and New York. I'll add it to my list of things to do when visiting NYC -- see Statue of Liberty, go ice skating, eat good italian food, check out the new frog! This month’s Treehouse chat is with Christa Kermode. She’s a Virginia State Parks Ranger and currently works as the Volunteer/Special Events Coordinator at Sky Meadows State Park. As a volunteer with Sky Meadows (I take pictures at the park and park events), I got to know Christa a few years ago. She’s always a friendly face, keeping the enthusiastic, but not necessarily focused, volunteers like me on task and enjoying our jobs. Christa’s job is critical to the success of the park. Thanks to budget cuts and a small full- and part-time staff, state parks rely heavily on volunteer hours to provide trail maintenance, educational programs, and guided hikes, just to name a few activities. Let’s chat. Christa, what’s your educational background? I graduated in 2002 with my BA in Environmental Studies/Geography from UCLA. Wow, you’re a long way from California… Well, I was born and raised in Michigan. Then my boyfriend (now husband) and I went to school out in California. When it came time to find jobs, Virginia had a great one for my husband, and I found a job that I really enjoy with the state parks. What is it that you enjoy about your job? I love working with our wonderful volunteer team and chatting with visitors (interviewer’s note: Christa makes volunteering a fun and rewarding experience. We get to know the park and its environment and history, take part in activities like the Dog Day at the park – see Christa’s photo with her dog, Pepper, and even enjoy a spaghetti dinner, made by Christa, at a local winery each year as a “thank you” for volunteering). What is your favorite activity outside of work? (green or not green) Currently my favorite activities outside of work are reading outside and enjoying the fresh air. Which place most inspires you to keep working for the environment? I love Yosemite National Park, but I also love Sky Meadows here in VA. 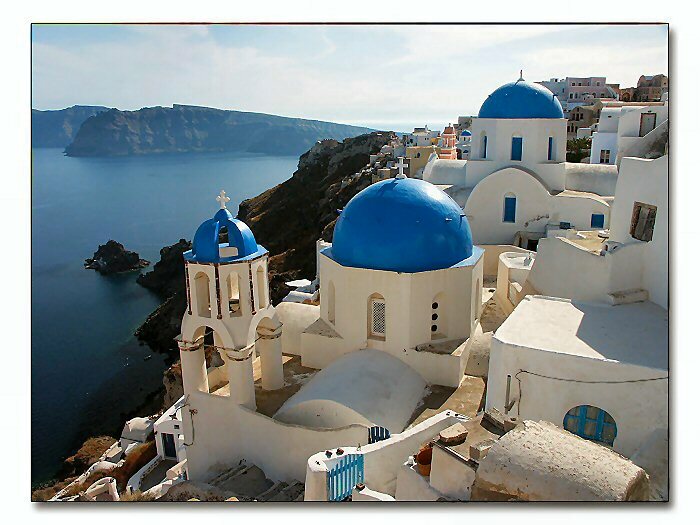 I find the beautiful views and mountains of both places inspiring! What’s one green tip you can give to blog readers? Now that the weather is turning warm, try planting a garden. When it comes to food, grow your own or buy local! It was a chilly Saturday morning, with temperatures in the 30s, and the first Saturday in a very long time without an early morning hockey game or two. Was it the perfect morning for a sweet greenmomster to let the family sleep in and surprise them with a breakfast of whole wheat waffles covered in fresh fruit and organic whip cream? Au contraire! I woke the family up, told them to put on their jackets, and get ready to wade in ice-cold water – we were going stream monitoring! To the quiet hum of children moaning and complaining, we drove off to help out with the search for benthic macroinvertebrates (large bugs and other animals without backbones that live on the stream bottom) in one of our local streams. I chose a stream that I knew was in our local watershed. A watershed is an area in which all water (rain, snowmelt, etc.) runs into the same stream or river. Any water that people in my neighborhood use to water plants, rinse off the driveway, or wash a car can eventually end up in this particular stream (see Friends of Accotink Creek). 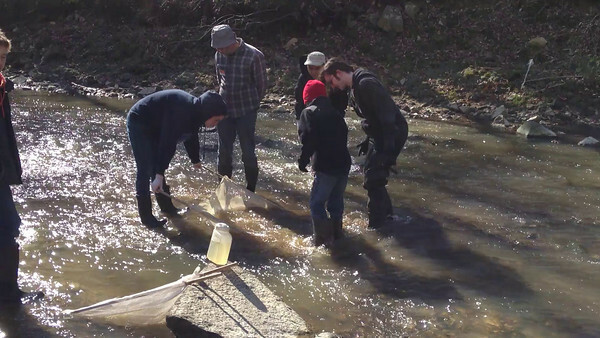 In order to survey the stream, you need people to hold the net and people to “dance,” or stir up the stream bottom to catch any invertebrates that come swimming away. Then, the group takes a look in the net and counts all of the various critters. High biodiversity, or variety in the types of animals we see, is one indicator of a healthy stream. The good news is that the kids actually enjoyed themselves (heh, heh, I knew they would!) and learned a little something about their local environment. The bad news is the lack of biodiversity in the stream. How can we help get our streams healthier? Decrease use of pesticides and fertilizers, plant native plants because they need fewer chemicals than non-natives, and fix any oil or antifreeze leaks in your car. Activities like this one are happening throughout the country – a quick search of your local area will turn up the schedule of activities that anyone can join. These activities are great for a number of reasons. First, kids really see the fun side of science. 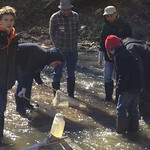 Instead of sitting in a classroom, listening to the teacher or reading a textbook (both of which are important activities), kids are out in the stream, churning up water, and counting critters. They get to see the scientific process at work. Second, we all begin to see our role in protecting our local environment. An interesting study in PLoS ONE by Ballouard, et al (2011) showed that the internet seems to be making our children aware of charismatic, exotic animals (like tigers), at the expense of knowledge about local species. Kids and adults are starting to lose touch with their local environments and their role in protection of that environment. I see this phenomenon all the time in my classroom; students can tell me about animals in the rainforest, but they can’t tell me 5 bird species we might find outside the classroom window. The third reason this is a great activity is that we’re contributing to “citizen science.” More and more, everyday citizens, as opposed to professional scientists, are making valuable contributions to data collection. I used citizen scientists in my dissertation research. Without my more than 50 volunteers, there’s no way I could have surveyed over 100 butterfly gardens each week for 2 years! You can sleep late some other day! Get out and enjoy the environment in your own backyard! OK, I was going to give you a totally different recipe this week, but that will have to wait. Since I was just writing about bees and honey yesterday, I think this recipe is a better fit for the "theme o' the week." The recipe is for burnt-honey gnocchi (from Jerry James Stone) and you can find it at Treehugger. I haven't tried the recipe yet, but it looks mmm, mmm good! If you try it, let us know how it comes out! I am happy, happy, happy today. It’s a beautiful, unseasonably warm day in the beginning of March. I just checked our beehive and they made it through the winter! I found the queen, she’s laying, and some of the workers even had pollen behind their “knees.” All seems to be going well in the hive. So the question is, to split or not to split? “Splitting” a hive means you take some frames from one hive and try to start a new hive with them. I’m relatively new to beekeeping (this was our hive’s third winter), but the old-timers seem to say that it’s easier to manage two hives, rather than one. We’ll need to make a decision in the next couple of weeks, so over that time I’ll be spending some time staring blankly through the dining room window at the hive in our backyard, hoping for a lightning bolt or some other sort of sign about what to do. Our family got into beekeeping a few years ago after attending a 4H fair. My son, Sammy, announced that he really, really wanted to try beekeeping. Now, Sammy is a man of many passions. He loves hockey; he loves legos. He attends bonsai workshops and loves planting and caring for the little trees. He’s an avid reader, plays soccer, raises leopard geckos, and plays the bass. Basically, Sammy has a great deal of “Joie de Vivre.” So when he told me about the beekeeping, I figured this might be a passing fad. I told Sammy that he could have a beehive, but he’d have to attend 4H meetings for one year before I would take the adult class and buy everything for the hive. I learned the ol’ “4H for one year” trick from my mother. When I was a little girl, I really, really wanted a rabbit. My mom said fine, I could have a rabbit, but I had to attend 4H in order to get the rabbit. I was so excited at my first 4H meeting! Sitting there in the public library meeting room, we heard all about rabbits and rabbit care. The adult leader handed out a schedule of the year’s activities: build the hutch, get the rabbit, care for the rabbit, learn about rabbit diseases, show rabbit at the 4H fair, SLAUGHTER THE RABBIT! That was my first and last 4H meeting, and I never did get my rabbit. Well, 4H has changed a lot in the past 40 years. It’s a lot of fun and the kids really learn about their animals. My kids are in the local 4H bee club and the dog training club. The adult leaders generously give of their time and the kids really enjoy themselves. Needless to say, although it may be part of some of the more agricultural clubs, we haven’t had to slaughter anything. So, the ol’ “4H for one year” trick backfired, and I now have a beehive in my backyard. I have a love/hate relationship with “the girls.” On early spring days like today, it lifts my spirits to see them break cluster and fly. In the middle of summer when they’re hungry and I have to feed them every other day (not enough nectar sources here in the ‘burbs), we both have slightly bad attitudes – they want to sting me and I might smoke them a little too vigorously. When we’re harvesting honey, I’m thankful for their hard work. Over the summer, I love watching the kids show the honey and candles at the 4H fair. When we’re making candles at Christmas, I’m glad “the girls” are snug in the hive, riding out another winter. Our bees made it through the winter! Now starts another spring and summer bee adventure, and that’s why I’m so happy. Last night, I attended a screening of the National Resources Defense Council’s (NRDC) new film, “Acid Test: The Global Challenge of Ocean Acidification.” This 20 minute film is definitely worth the time to watch, and the NRDC has generously allowed free distribution. I hope you’ll take a little time to watch it. Now, you may have the same reaction that I did – sure, 500 billion tons is a lot, but the oceans are pretty darn big too. I mean, they can be as deep as 5,000 meters. Fortunately, the local chapter of the Sierra Club, which sponsored the film screening, invited a local oceans expert from George Mason University to answer some questions. He explained that the portion of the ocean that we most commonly encounter is the top 200 meters. That’s where we find most of the sea life on which we depend. That’s where fluctuations in currents impact our climate and weather. So 500 billion tons into the top 200 meters can have a very substantial effect on the health of our oceans. Ocean acidification affects the many species of animals that build exoskeletons, or external shells or skeletons. These animals need carbonate (another molecule) from which they build these exoskeletons. The availability of carbonate is negatively affected by an increase in ocean acidity (or a drop in pH). If ocean acidity gets high enough, the environment can even become corrosive to the shells of these organisms. The worry is that many of these species could become depleted or even extinct. But what if you’re not really interested in ocean ecology? Who really gives a flying flit if a few little invertebrates can’t make shells? Well, those little invertebrates are the basis of the ocean food chain. Little animals get eaten by bigger animals, which get eaten by bigger animals. Humans are part of this food chain. The reason to care, if you’re not concerned about species extinction and nature in general, is that your food source could be severely impacted. For great information on worldwide fisheries, check out UN Food and Agriculture, Fisheries and Aquaculture Department. do your part to reduce use of fossil fuels through conservation at home and on the road. Any comments on the film? Update on "reduce, reuse, recycle"
It was as if the Washington Post is reading my blog! Check out the Washington Post's article on renting, rather than buying, things that you'll only need for a little while. What a great idea! The article mentions well-known rentals, such as Netflix, Capital Bikeshare or Zipcar, and lesser known rental opportunities like renting designer neckties, kids educational toys, and moving boxes. This idea really got me curious, so I tried to find some other rental opportunities. I knew one could rent Halloween costumes, but I also found out that you can rent handbags and clothing, lawn equipment (or you can buy big-ticket items with your neighbors and share them), jewelry, and wedding jewelry, Students can rent textbooks from a number of websites. Just another way of putting the "reduce" in pollution prevention. Anyone else have ideas for items to rent? Being the best Greenmomster in the whole, wide world, I took my kids out to dinner and The Lorax movie on the day it opened (check out the kid’s page with enviro-tips and activities). Based on my movie preferences, I knew I’d like it – it’s less than 90 minutes and has talking animals (see my earlier movie reviews). The movie expands on the book, The Lorax, by Dr. Seuss. Since the book is relatively short, the movie makers added a future to the story – we find out who received the truffula seed, why he received it, and what he did with it. The movie’s got it all, environmental message, budding romance, and the obligatory chase scene. It’s even got a few musical numbers! I would’ve liked to hear a bit more of Seuss’ poetry in the movie, but all in all, I liked this flick. As I was watching The Lorax, the old phrase “reduce, reuse, recycle” came to mind. At one point, one of the characters, the Once-ler, did a musical number about his invention, the Thneed. Totally forgetting the “reduce, reuse, recycle” ethos, the Once-ler produces thousands of Thneeds. What’s a Thneed? According to the original book, “A Thneed’s a Fine-Something-That-All-People-Need! It’s a shirt. It’s a sock. It’s a glove. It’s a hat. But it has other uses. Yes, far beyond that. You can use it for carpets. For pillows! For sheets! Or curtains! Or covers for bicycles seats!” Yes, the Once-ler was convinced that he was making something that people needed and wanted. And the movie shows thousands of people clamoring for this invention, convinced that they needed it. But then my son made an interesting observation. He noticed that no one was wearing or using a Thneed later in the movie. Obviously, this thing that everyone HAD to have, wasn’t really so necessary. This one little point from the movie got me thinking about all the things that we HAVE to have; all of the things we use precious natural resources to produce that end up in a closet, garage, or landfill somewhere. How many times have we replaced a phone, to get a newer, smarter one? How many times have we thrown away food that rotted before we got around to eating it? Got the latest exercise equipment gathering dust in your basement? What about taking an unnecessary bag at the store? Ever grabbed too many mustard packets at a restaurant (to avoid having to get up and get more), and then thrown them away at the end of the meal? It’s the “reduce” portion of the pollution prevention puzzle that’s the most important, but also seems to be the most difficult to achieve. Take a quick look at many of the “environmental” websites and blogs out there – how many are simply selling “green” products? Rather than reducing the constant consumption that affects our environment, we fool ourselves into thinking that “green” consumption is somehow innocuous. It may be better than other consumption, but even “green” consumption is consumption. So should we simply stop buying stuff? I think we all know that’s not an option for most of us. We all need food, clothing, housing, and some of the fun stuff too (I personally enjoy printing my photographs and wearing decent running shoes). What we need to do is become more conscious of our decisions, trying to focus heavily on the “reduce” part of pollution prevention. When you do want to make a purchase, think twice. You’re not just deciding whether you can afford it, but deciding whether the planet can afford it – are you using resources wisely? For my fellow greenmomsters, I know this is a tricky time in life to reduce. I recently saw a photo project of Swedish students posing for photos with all of their belongings made into a sculpture. Who doesn’t remember the days when we could fit everything we owned into the back of a station wagon? Back then, “reduce” was a pretty easy goal – just one person to fend for, a relatively low starting salary, roommates from whom we could borrow what we needed. But now that we’re greenmomsters, the stuff really can pile up. The key for us is being conscious of our decisions. Resources that we choose to use now, may not be available for our kids later.